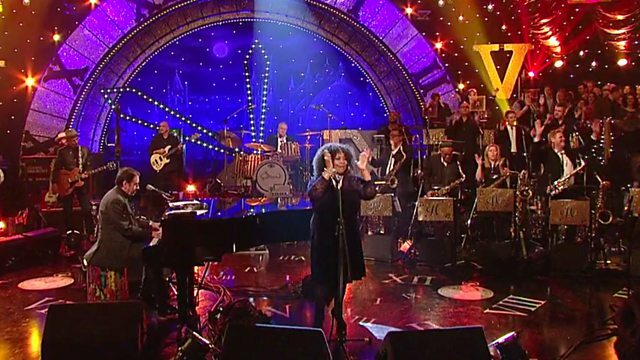 Jools Holland and his Rhythm & Blues Orchestra welcome in the New Year with guests including Sir Tom Jones, Jess Glynne, Paul Weller, Hozier, Rhiannon Giddens and James Bay. Joining Jools Holland and his Rhythm & Blues Orchestra to welcome in the New Year is Sir Tom Jones, performing some of his biggest hits and even the odd duet. Jess Glynne performs some of the hits from her big-selling debut album I Cry When I Laugh. Paul Weller performs songs from his acclaimed 12th solo album and a treat or two from The Jam's back catalogue. Future Islands spent long years on the road before going on to do stunning performances on the David Letterman Show and then Later..., courtesy of the captivating moves and heartbroken sincerity of frontman Samuel T Herring. Hozier sits in with the orchestra on a unique version of his multi-platinum song Take Me to Church. Rhiannon Giddens takes to the studio floor to perform songs from her debut album. James Bay drops in to perform his anthem Hold Back the River, from his big-selling debut album Chaos and the Calm. Beth Hart brings her bluesy authority to songs from her album Better Than Home, including a ballad featuring guitar legend and friend Jeff Beck, with whom she performed in front of Barack Obama in tribute to Buddy Guy. Jools and the Orchestra are also joined by artists who have been guesting on their latest tour, including KT Tunstall, Pauline Black and Arthur 'Gaps' Hendrickson and Jools's long-serving collaborator and friend Ruby Turner. Throw in the Pipes and Drums of the 1st Battalion Scots Guards sound-tracking the Midnight Moment and a star-studded audience from the year just passing to throw in their resolutions and predictions for 2016 and you have an ideal New Year's Eve that invites you to party on your sofa. This is the 23rd Hootenanny on BBC2, the first show launching at Television Centre in 1993 with a cast that included Sting, Paul Young and Chaka Demus & Pliers. Jools Holland presents legendary musicians and brand new acts from around the world.